Peanut - Diamond in the Ruff Rescue & Rehab, Inc.
Peanut came to us from a good Samaritan who found him walking around the neighborhood. They noticed that Peanut had been holding up his right front leg, and wobbled on it occasionally. We thought maybe he had been hit by a car, and was in a lot of pain due to a major incident. When he was examined, the veterinarian found that his leg wasnt broken, and he was not in any pain. The reason he held out his leg was due to a previous injury that damaged his nerves permanently. He is not in pain, and he does have feeling in this leg. He can also use his leg whenever he desires. 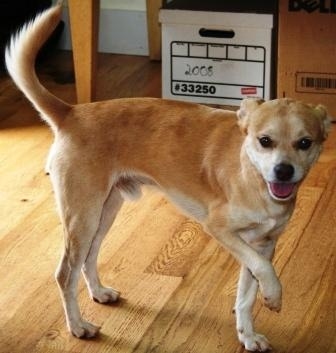 Peanut is currently in a foster home, where he gets along great with other animals. In fact, his best friend is a 12 week old kitten, by the name of Bugsly. Because of his love for Bugsly, we assume he is great with all cats. Also, in his foster home, he loves to crawl under the comforter and snuggle. He will sit up on command and do treats too! Peanut is a great dog, and could be suited to about any family or lifestyle. Peanut has been with us for a while, and has had little attention from the public, most likely due to the paw the holds up. His nerve damage does not hamper his daily activities, and certainly does not slow him down! He does not need any special medical attention for this paw, and he is in perfect health! A home with children over the age of eight would be perfect for Peanut. He is a low to medium energy dog, so an owner who would love a companion to tag along on walks would be fitting. Peanut has since been adopted!